According to the Houzz Kitchen Remodeling Survey, tile still remains the most popular material used in kitchen backsplashes. But a trend is definitely under foot. Why choose metal tiles, stainless steel, glass, stone, tin and bronze materials in your kitchen? Because a metal backsplash blends with most color and design schemes. A contemporary stainless steel version lends an edgy industrial vibe. 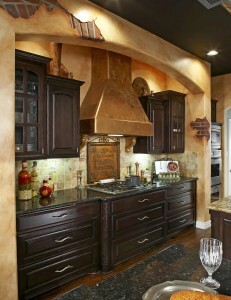 Yet, a copper or tin backsplash appeals to a rustic and nostalgic sensibility. Because a metal backsplash is possibly the simplest of backsplashes to clean. Just sponge off with soap and water. Because a metal backsplash or countertop holds heat easily. Hot pots and pans won’t affect the surface. Because a metal backsplash harmonizes well with stainless steel appliances, still very popular with homeowners. Because acidic foods (oranges, coffee) might stain some metals if left for lengthy periods of time on the surface. Because copper surfaces will require polishing to maintain its original shine; however stainless steel won’t. Consumers seeking something unique are increasingly choosing metal. Designers, remodelers and renovators support the new trend. Of course, you need to decide what’s best for you and your family.